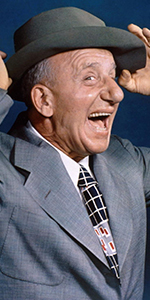 Jimmy Durante was another of the great all-round showbiz people during the Golden Age of Hollywood. Odd-looking (with his famously large nose), gravel-throated, with boundless energy, always looking for girls and the next laugh, Durante — once encountered in person, on film, on the radio, on television, on stage — is always remembered. Born to Italian immigrants in New York, Durante was raised as a Catholic. Hard to imagine him as an altar boy, but it's true. He dropped out of the seventh grade in order to play ragtime piano in saloons and bars in the city, eventually getting a slot in the Original New Orleans Jazz Band — the only member not from the Big Easy. The group made recordings under this name, but by 1920, Durante's habit of telling jokes and breaking into song at the keyboard made him the star, and the group was re-named Jimmy Durante's Jazz Band. Vaudeville was next, with Durante on the road with Lou Clayton and Eddie Jackson. Durante and Jackson both made their Broadway debuts in the George Gershwin Musical Show Girl in the 1929 season. They both made their film debuts in Roadhouse Nights (released in February, 1930). After enjoying a major success with his recording of his song "Inka Dinka Doo," Durante was sought after for both the screen and the stage. He was the star of the Broadway show Jumbo in the 1935-1936 season, the Cole Porter Musical Red Hot and Blue in the 1936-1937 season, and the revue Keep Off the Grass in the 1940 season. But Durante was also sought after to appear in films, and while not usually the star, he always made a lasting impression in films like The Wet Parade (whichhad its premiere at the Chinese in March, 1932), and The Phantom President (released in September, 1932), where he sang his original song about his nose, "Schnozzola." He made three films with Buster Keaton, Speak Easily (released in August, 1932), The Passionate Plumber (released in February, 1932), and What! No Beer? (released in February, 1933), but the comic styles of the two men were so different, with Keaton suffering in comparison. In September of 1933, Durante joined the cast of The Chase and Sanborn Hour on NBC, and stayed until November. When host Eddie Cantor left the show in April, 1934, Durante took over and stayed until September, 1934. After that, Durante had his own show called The Jumbo Fire Chief Program on NBC from October, 1935, to January, 1936. More films for Durante include George White's Scandals (released in March, 1934), Sally, Irene and Mary (which played the Chinese in March, 1938), and You're in the Army Now (released in December, 1941). Durante gives his most "out there" performance as Banjo, in the comedy The Man Who Came to Dinner (released in January, 1942), with Monty Woolley. On radio, Durante teamed with Gary Moore for The Durante-Moore Show on both NBC and CBS from March, 1943 to June,1947, and as The Jimmy Durante Show on NBC from October, 1947 to June, 1950. 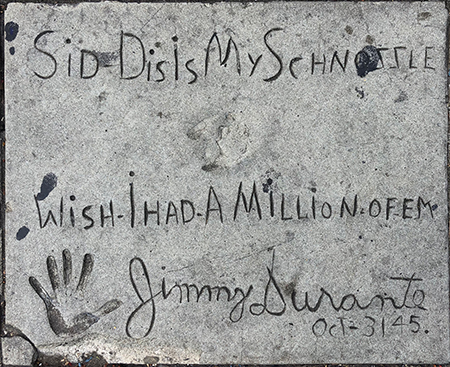 Sid Grauman had Durante down to the theatre in October, 1945, and with actress Joan Thorsen, they both pushed his "Schnozzola" into the cement. Durante got fewer roles in films after World War II, but still appeared in Two Sisters from Boston (released in April, 1946), and It Happened in Brooklyn (released in April, 1947). All through the 1950s Durante was on television a good deal, then he returned to the screen in Billy Rose's Jumbo (released in December, 1962), and It's a Mad, Mad, Mad, Mad, World (released in December, 1963). Durante became a pitchman for Kellogg's Corn Flakes during the 1960s. In his later years, Durante turned to recording standards and his own songs, many of which are heard in films today: "As Time Goes By" and "Make Someone Happy"
Durante retired from performing after a stroke in 1972. He died of pneumonia in 1980 at the age of 86. Grauman's Chinese Theatre, Hollywood, California. Jimmy Durante Forecourt ceremony, Wednesday, October 31, 1945. 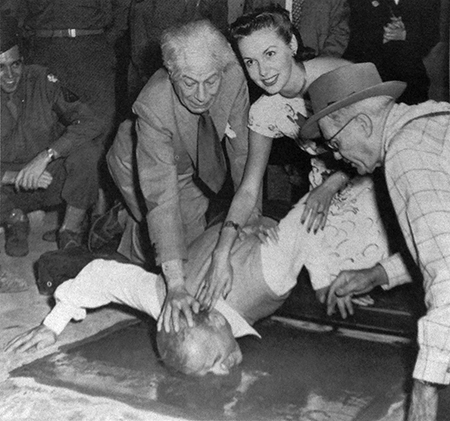 Sid Grauman and actress Joan Thorsen push Jimmy Durante's "Schnozzola" into the cement as cement artist Jean Klossner looks on.